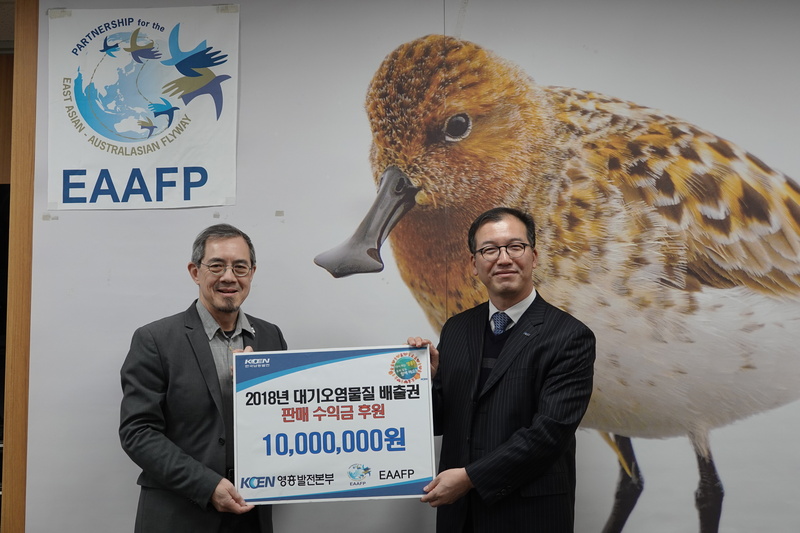 EAAFP Secretariat is excited to announce that we received a generous donation from the Korea South-East Power Co., Ltd. (KOEN) Yeongheung Power Division with 10,000,000 KRW (approximately 8,900 USD). On Friday February 1st 2019, Mr. Chang-sup Moon, the Senior Manager of Environmental Technology department and Mr. Sun-hyeon Jeong, the Senior Manager of Green Environment Team visited our EAAFP Secretariat to hand over the donation. The donation was made from KOEN Yeongheung’s successful performance in the Emission Trading System (ETS) last year. The company managed to achieve substantial reduction in emission level in 2018, which led to make additional profits from the ETS. The donation will be used for producing educational posters on waterbirds in Incheon- Gyeonggi Bay area. In August 2018, the Secretariat and KOEN signed an MOU to collaborate on conservation of migratory waterbirds and their habitats in the region. Since then, the two organizations have worked closely to support the local environment NGOs in raising awareness of protecting bird habitats for students and the public. The EAAFP Secretariat appreciates the KOEN’s support and hopes to strengthen the relationship even further.